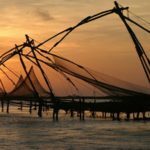 Goa’s warm beaches, cool waters, ancient churches, and majestic forts attract hundreds and thousands of visitors from all over the world, every year. 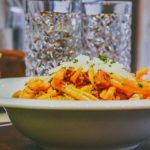 While many tourists flock to the beach to bask under the hot sun or swim in the sparkling, blue sea water, there are other tourists who wish to indulge in the place’s rich, cultural, religious and historical past. This list compiles some of the top Places to See in Old Goa and its most iconic landmarks. 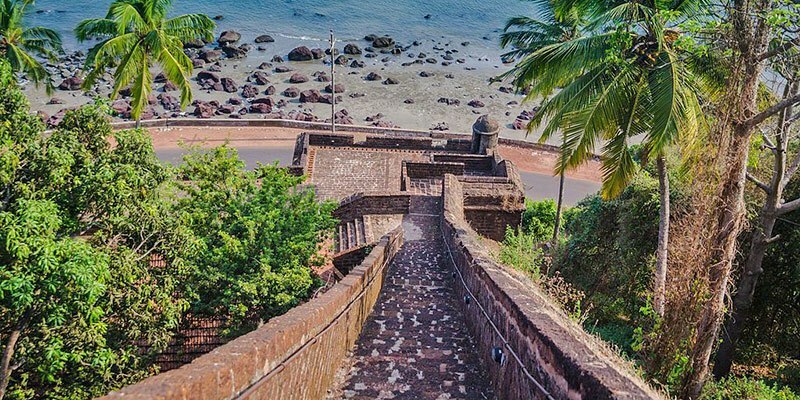 From grand basilicas, tombs and churches, to tall forts and modern museums, this list gives tourists the best suggestions to make the most out of their visit to Old Goa. 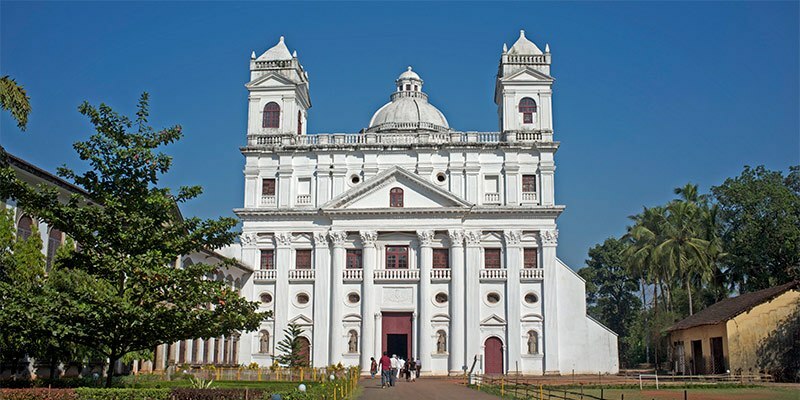 Built in the 16th century, this basilica is Goa’s most frequently visited tourist destination. Flaunting impressive Jesuit and Baroque architecture, this basilica was labelled as a World Heritage Monument. The basilica also showcases some unique Corinthian and Doric works, sure to intrigue any Architecture or History enthusiast. With large, black, granite walls, basalt pillars and a sloping, tiled roof, the church uses some very diverse architectural techniques, while ensuring that the design remains relatively simple, yet sophisticated. There are tiny, ornate Latin and Portuguese inscriptions carved onto the gilded pillars, walls and altar of the church, reminding tourists that this basilica is a remnant from Goa’s rich, historical and cultural past. The body of St. Francis Xavier is also buried in one of the chapels here. 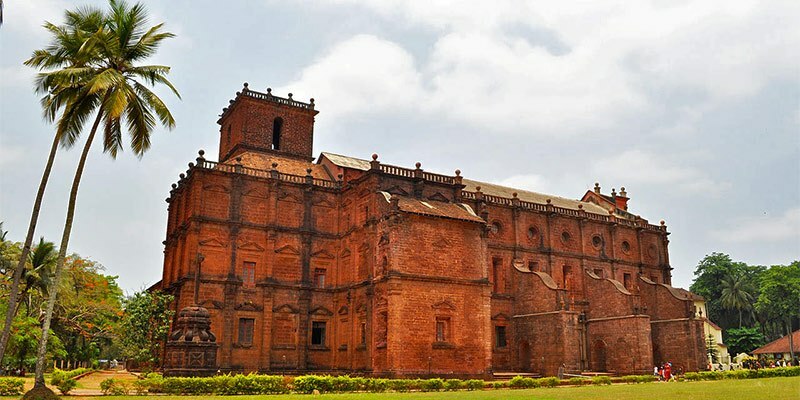 Although today, much of this church lies in ruins, the Basilica of Bom Jesus stands as an example of exemplary, flawless architecture. Within the Basilica of Bom Jesus, there lies the tomb of the revered Portuguese evangelist, St. Francis Xavier. During his stay in Goa, he has been said to have nursed the sick, opened up innumerable churches and even converted thousands of people to Christianity. He later travelled to the Far East where he continued his evangelical and missionary duties. Although he died on a tiny island in China, his body was brought back to Goa. The tomb, which was only completed 140 years after St. Francis Xavier’s death, was carved by famed Italian sculptor, Giovanni Batista Foggini. Made of Jasper and marble, this tomb has three layers: the base, mausoleum and casket. The tomb is complete with delicate silver statues of the famous evangelist and ornate, bronze plates and large paintings, depicting scenes from St. Xavier’s life. 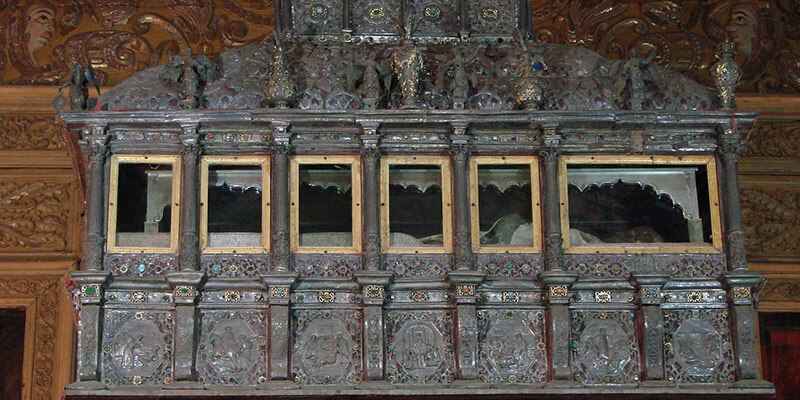 The saint’s remains are unearthed and publicly displayed once every ten years. The Divar Island, located on the serene, crystal-clear Mandovi River, is not a very popular tourist destination, so is perfect for those looking to enjoy a day away from Goa’s hustle and bustle. Visitors must take a ferry from the Viceroy’s Arch in Old Goa and cross the deep, blue, paradisiacal waters of the Mandovi River to reach this quaint little island. A short distance from the Divar Island wharf, there is the sacred Saptkoteshwar temple-one of the most revered Hindu worshipping sites in Goa. The picturesque Piedade village is a popular destination for those visiting this island. The ancient, 16th century “Our Lady of Compassion Church” rests delicately on top of a hill near this village. Those visiting this island during August might be lucky enough to witness the rich, vibrant, Bonderam Festival, where cheerful men, women and children line the streets of the island, waving beautiful, colourful flags, celebrating the harvest season. Built in 1707, this edifice, overlooking the Badez Taluk, was the Portuguese’s first line of defence. Situated on the mouth of the Mandovi River, the Reis Magos Fort is one of Goa’s oldest citadels. Its strategic location and high, impregnable walls rendered it invaluable to the Portuguese colonists. Although the fortress has undergone many renovations in recent years, it still remains a timeless beauty with its bright, reddish laterite stone walls and tall minarets, characteristic of Portuguese fort architecture. Complete with still intact underground tunnels and chambers, this fort is one of Goa’s best preserved historical sites. A trip to the Reis Magos Fort is not complete without a visit to the nearby Reis Magos Church which is another tourist hotspot. This fort is only open to the public for a couple of hours every day, so knowing the fort timings beforehand will reduce unnecessary hassle during the excursion. Flaunting Iberian architecture, this 16th-century edifice is the largest church in Asia and it is still operational! With high ceilings, intricate mosaic work and wooden carvings, this church is perhaps one of Old Goa’s most richly decorated buildings. 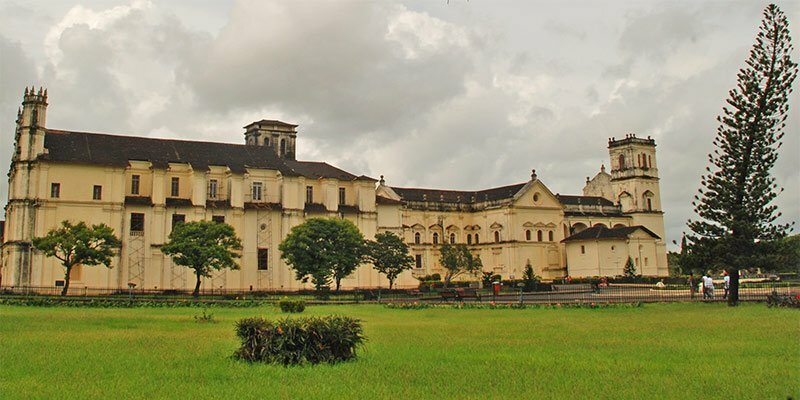 Dedicated to St. Catherine, this cathedral was built to commemorate the victory of Afonso Albuquerque and belongs to the Archbishop of Goa, today. Apart from the gilded altars, and rich paintings adorning the walls of the cathedral, there are also innumerable chapels and statues inside the church. Se Cathedral is laid out in the standard cruciform shape and above the altar there are gilded panels depicting scenes from St. Catherine’s life. Like most tourist spots, this cathedral is open to the public only for a couple of hours each day, so visitors must make sure they know the relevant church timings so as to make the most of their visit here. The Heritage Walk through Fonatainhas, a small Latin Quarter in Pajim, is a must for anyone looking to explore Goa beyond its beaches. A small spring –the “Fountain of Phoenix,”- gives the place its name. Colourful houses line the winding streets. These houses seem to have come straight out of a kid’s colouring book- such is their cute, vibrant facade and simple architecture. The smell of freshly baked bread sifts out of bakery shop windows. There is a bright, red wishing well, too, where visitors can take respite before continuing their way up to Altinho Hill- a magnificent structure, home of the Chief Minister and Archbishop of Goa. En route, visitors can catch a short glimpse into the 19th century Chapel of St. Sebastian. A walk through Fontainhas will not only prove enchanting and refreshing, but it is a great way to learn more about Goa’s rich cultural past. One of India’s few, large wax museums, this place has an extensive collection of 30 life-size paraffin sculptures. The statues include famous Indian personalities, including Mahatma Gandhi and Mother Teresa. 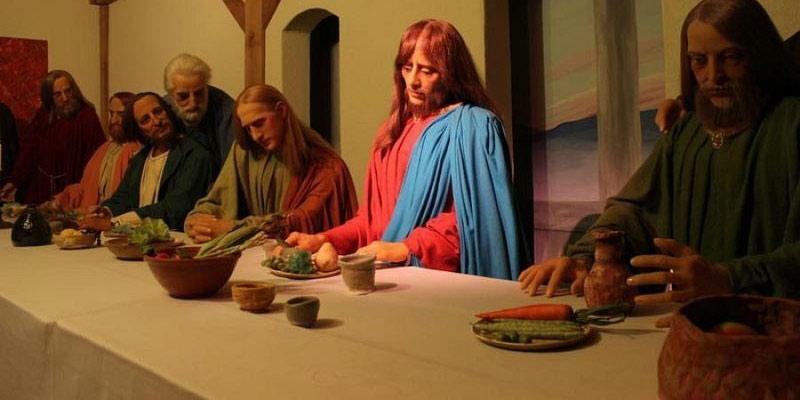 However, the museum’s most famous attraction is the sculpting of Jesus Christ’s “Last Supper,”- a truly wondrous piece of artwork, sure to leave visitors captivated! A guided tour is available in English and Hindi, for those visitors who wish to learn more about each sculptor. There is a small entry fee which should not be too much of a hindrance to visitors, but photography is strictly prohibited unless visitors make a camera pass beforehand at the museum’s counter. There is a small gift shop selling a range of merchandises, too, so tourists can pick up a small souvenir here, with which to remember their visit to the World Wax Museum. 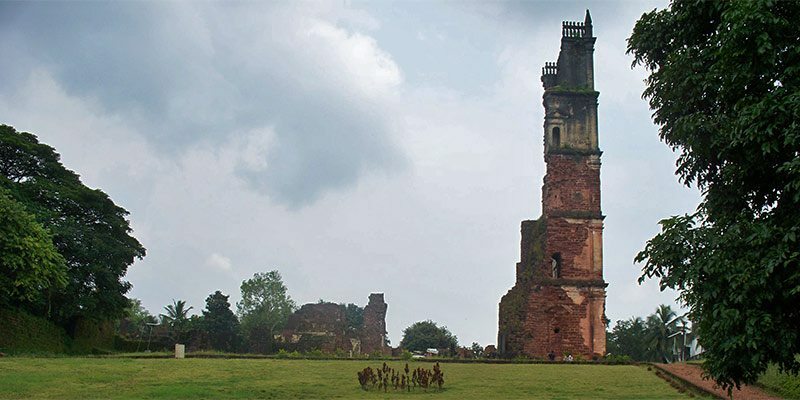 The St. Augustine Tower, formerly a 46m high belfry, is one of the most spectacular historical sites in Old Goa and is associated with the famed Nossa Senhora de Graca Chuch, built by the Augustinian Friars sometime in the early 17th century. This church rests on top of the Monte Santo Hill in Velha, the primary site for the Augustinian Order. The St. Augustine Church included eight, richly decorated chapels, innumerable altars, and a few chambers all designed by presumably, an Italian architect. 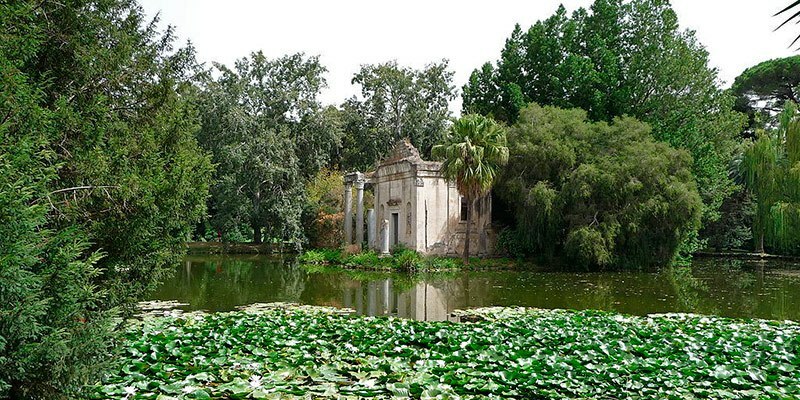 The Church was said to be one of the three most renowned examples of Iberian architecture in the world, so this destination is sure to be a treat for anyone with a keen interest in that area. Decades of neglect and bad maintenance rendered the fort unusable and by 1938, much of the building had collapsed, leaving only the high belfry tower standing. Dedicated to St. Cajetun, a contemporary of St. Francis Xavier, this church is Goa’s most beautiful and best preserved historical site. Displaying gorgeous Corinthian style architecture, this church is reminiscent of the St. Peter’s Basilica in Rome. The walls of the church are adorned with vibrant paintings depicting the life of St. Cajetun. Ornate statues are built into little niches within the church walls and the altars flaunt delicate carvings. Elaborate gateways, with tiny Hindu inscriptions decorate the archways of this church. Built by Italian monks of The Theatines in 1665, the church contains a small, 22 meter deep well, and a small convent which used to house visiting governors or other notable dignitaries. The Church of St. Cajetun has withstood the tests of time. 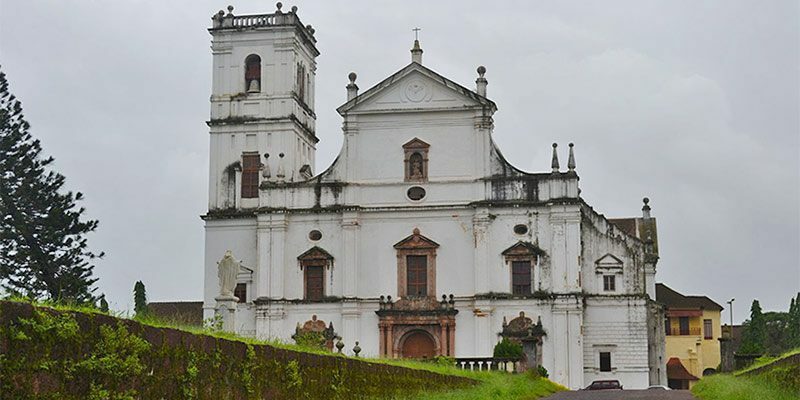 Combining beauty and elegance, the St. Cajetun Church is a must visit for any tourist looking to delve deep into Goa’s rich and glorious past. Established in 1964, the Archaeological Museum contains artefacts from the pre-historic, early historic and late medieval periods. The museum houses innumerable portraits, wooden sculptures, large, ornate pillars, delicate postal stamp collections and other objects from the Portuguese period. Although the place is filled with many awe-inspiring relics from the past, the more famous attractions in this museum include the John the Baptist, wooden statue, the Ivory sculpture showing Christ’s crucification and a bronze statue of Goa’s first governor, Albuquerque. 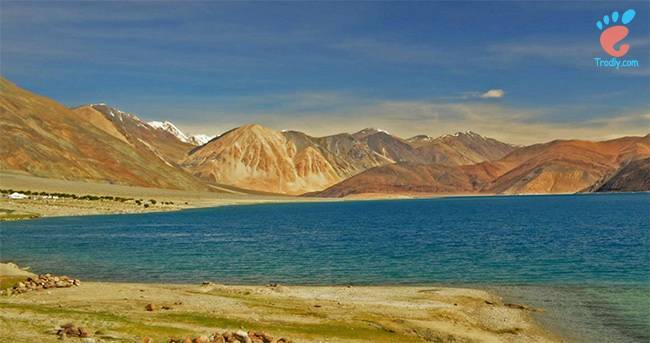 Apart from these captivating, historic relics, there is also a children’s activity centre and a small video screening session showing the different World Heritage Properties in India. Visitors must make sure they know the relevant museum timings, beforehand. 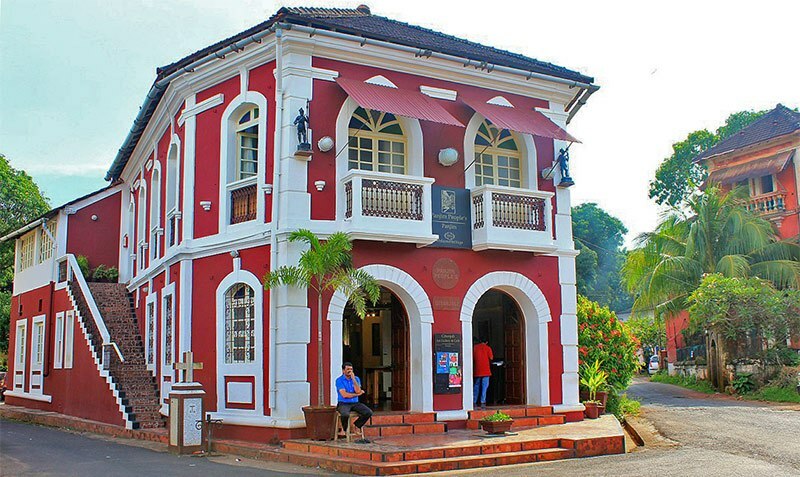 A look through this museum is definitely worth the five rupee entree fee and the age-old inscriptions, arms and plates will surely let visitors experience Goa’s rich cultural and historical past, first hand.